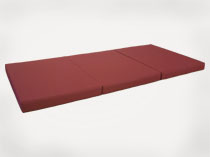 The foundation of our futon begins with the bottom layer, our tri-fold foam mat. We use very high density polyurethane foam for 2 reasons. First, it provides excellent support and lasts for many years. Secondly, since the foam mat is a separate entity the foam can be easily replaced in the future. It is covered in 100% polyester poplin fabric which has proven to be extremely durable and can be water washed with excellent results. Tri-fold has the advantage of making this piece portable and space saving. We offer 2 densities, firm and extra firm although the majority of our customers find that the firm is quite sufficient. Available in 4 bed sizes. 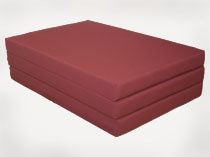 Tri-fold foam mat, folded up ready to be moved or stored. Very portable. 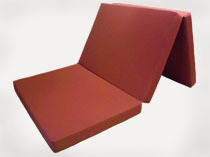 Foam mat is hinged so that it can be used as an occasional chair with 1 section up against the wall. Foam mat is fully opened and resting atop a tatami platform.